In a mortar and pestle, roughly grind together cardamom, cloves, coriander seed and white peppercorns. In a food processor add galangal, ginger, lemongrass, shallot and coriander root and blitz into a fine paste. Add a little water if required to create a finer consistency. Melt ghee in a medium-sized saucepan over a medium-high heat. Add ground spice mix and cinnamon and fry off for 1-2 minutes to release aromatics. Add paste and fry off for 3-4 minutes, being sure not to caramelise. Add coconut milk and bring to a boil. Once at a boil, tear kaffir lime leaves and add to sauce. Add mussels and immediately cover with lid. 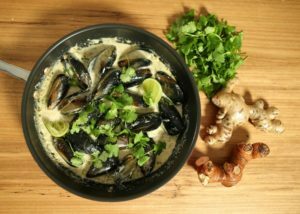 Allow mussels to steam for approximately 1 minute, possibly even less. Once mussels have opened, remove from heat. Taste and adjust as required with sugar, salt and fresh lime juice. Garnish with coriander and shredded kaffir lime leaves. Serve immediately in a communal dish.